If you didn’t already run out this weekend to see the Seth Rogen/Zac Efron joint Neighbors, you should. It really sets the bar for big, raunchy, R-rated comedies this summer, and not only is it totally hilarious, it’s way better written than it needs to be. But, science fiction fans have another reason to see this movie in the theater. One of the movies that will try to surpass Neighbors is Seth MacFarlane’s A Million Ways to Die in the West. A green band trailer for that film plays before Neighbors. This is something super new, something that hasn’t made its way online yet, so we can’t actually show it to you, but at the very end Doc Brown (Christopher Lloyd) and the DeLorean from Back to the Future show up for a quick visit. Our publisher, fellow science fiction addict, and all around rad guy, Josh, went to see Neighbors, and described the scene for us. The sets in A Million Ways already look a lot like those from Back to the Future Part III, when Marty McFly (Michael J. Fox) and Doc Brown have an adventure in the old west. That’s not too surprising, MacFarlane is a big fan of this kind of homage, just look at what he did with Flash Gordon a few years ago in Ted, not to mention the obsessive pop culture references of Family Guy. At the very end of the trailer—this is the very last thing that happens—MacFarlane wanders up to a building that looks exactly like Doc Brown’s hideout in BTTF 3. A bunch of blue lights start flashing inside, coming out through the cracks and shining through the windows. He opens the door and asks exactly what the hell is going on in here. Inside he finds Doc Brown, in his full old west get up. Flustered and crazy looking, he stands next to the DeLorean which is half-covered by a tarp. It’s worth noting that this is the DeLorean from BTTF, not the version from BTTF 3. Doc shouts, “It’s nothing, it’s just a weather experiment,” and the trailer ends. Now we start a whole different conversation. Is this actually in the film? Trailers are notorious for including footage and scenes that don’t make the final cut of the film. The promos for Neighbors are a prime example of this, as there is a ton of stuff in the commercials that isn’t in the theatrical film. And this style of comedy, full of improvisation, lends itself to lots of additional footage. Also, we wouldn’t put it past MacFarlane to do stage a moment like this just for a trailer. So there’s that. 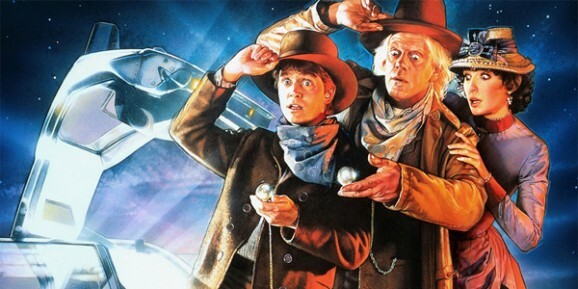 If Doc Brown and the DeLorean do make an appearance in A Million to Die in the West, is it just as a cameo like this, or are they really going to be in the movie? Odds are, this is going to be a fun, but momentary appearance that won’t really impact the larger narrative. After all, we doubt that MacFarlane is going for complete and total period accuracy. Maybe MacFarlane’s character hits his head and this is a hallucination, who knows, but it’s going to be fun to find out. However it happens, this trailer sounds like a damn fine time. I’ve already seen Neighbors, sans any other previews, but this makes me want to go again just so I can see this. We don’t know if this footage is playing in front of all the prints—trailers often vary region to region—so if you rush out and it isn’t there, our apologies. Like we said, this is new and hasn’t hit the Internet yet, but we’ll let you know as soon as it does.